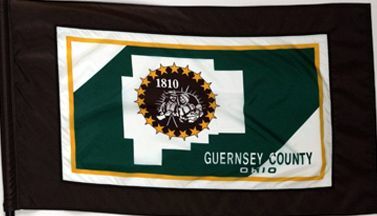 A green, black, yellow and white flag centers on a white silhouette of Guernsey County. Inside that outline appear an image of a pioneer family in a stagecoach, and a circle of nineteen yellow stars. Zane's Trace and the National Road went through this area, and were important for early American travelers. The flag is the result of a contest. It was adopted in 1987. The name of the county reminds us that many of its early settlers came from the Isle of Guernsey in the English Channel.